On occasion of Eid al-Adha, we would like to wish all our readers Eid Mubarak! Certainly the occasion which commemorates the sacrifice of Abraham (P) and his son Ishmael (P) is a more benign and noble tradition as compared to the “blood sacrifice” [the pagan imagery] of a half-naked man-god who died humiliatingly swinging from a Roman cross. May Allah give victory to our Deen and wipe out that Trinitarian religion in the foreseeable future, insha’allah. At the end of the Hajj (annual pilgrimage to Mecca), Muslims throughout the world celebrate the holiday of Eid al-Adha (Festival of Sacrifice). 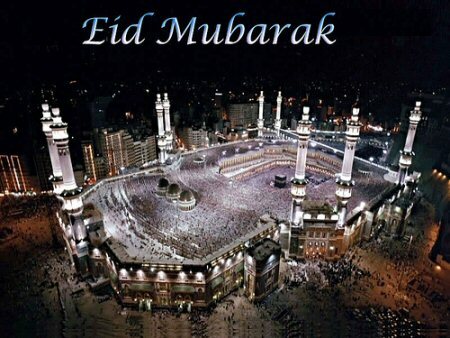 In 2006, Eid al-Adha will begin on approximately December 31st, and will last for three days. One of Abraham’s main trials was to face the command of Allah to kill his only son. Upon hearing this command, he prepared to submit to Allah’s will. When he was all prepared to do it, Allah revealed to him that his “sacrifice” had already been fulfilled. He had shown that his love for his Lord superseded all others, that he would lay down his own life or the lives of those dear to him in order to submit to God. Why do Muslims sacrifice an animal on this day? During the celebration of Eid al-Adha, Muslims commemorate and remember Abraham’s trials, by themselves slaughtering an animal such as a sheep, camel, or goat. This action is very often misunderstood by those outside the faith. Allah has given us power over animals and allowed us to eat meat, but only if we pronounce His name at the solemn act of taking life. Muslims slaughter animals in the same way throughout the year. By saying the name of Allah at the time of slaughter, we are reminded that life is sacred. The meat from the sacrifice of Eid al-Adha is mostly given away to others. One-third is eaten by immediate family and relatives, one-third is given away to friends, and one-third is donated to the poor. The act symbolizes our willingness to give up things that are of benefit to us or close to our hearts, in order to follow Allah’s commands. It also symbolizes our willingness to give up some of our own bounties, in order to strengthen ties of friendship and help those who are in need. We recognize that all blessings come from Allah, and we should open our hearts and share with others. The symbolism is in the attitude — a willingness to make sacrifices in our lives in order to stay on the Straight Path. Each of us makes small sacrifices, giving up things that are fun or important to us. A true Muslim, one who submits his or herself completely to the Lord, is willing to follow Allah’s commands completely and obediently. It is this strength of heart, purity in faith, and willing obedience that our Lord desires from us. What else do Muslims do to celebrate the holiday? On the first morning of Eid al-Adha, Muslims around the world attend morning prayers at their local mosques. Prayers are followed by visits with family and friends, and the exchange of greetings and gifts. At some point, members of the family will visit a local farm or otherwise will make arrangements for the slaughter of an animal. The meat is distributed during the days of the holiday or shortly thereafter. Eid mubarak to the ummah! Eid mubarik to teem members of Bismika Allahuma.